Giles Clarke came out swinging this morning, and sadly for Shaun Martyn and Lisa Sthalekar of the WICL, it wasn't that sort of out... or that sort of swinging! The ECB's press release was hard-hitting and aggressive, with Clarke and corner-man Clare Connor coming out 100% against the WICL. Connor's emphatic opposition to the project was something of a surprise to me, as she had previously expressed a much more positive public stance. 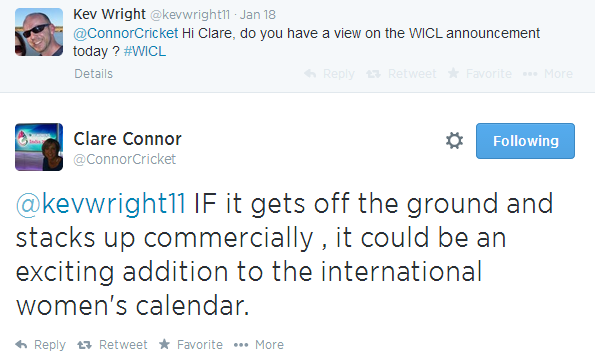 Clare Connor's position just a few months ago: an "exciting addition" to the calendar. Head Honcho Giles Clarke (who is clearly leading the charge on this one) claims that "there is no support or interest for this proposed event" but I can assure him that there is plenty of both among the fans and the players. Clarke, who made his millions at that well-known charitable institution Majestic Wines, then goes on to criticise the WICL for being a "privately run competition" as if: (a) that made a difference to anything; and (b) he would never do anything for money. To say I'm disappointed is an understatement; but I suspect my feelings are nothing compared to those of the players who are being denied the chance to participate in the WICL - the kind of opportunity men's cricket players take for granted, as they earn their six-figure-sums from their Big Bashes and their IPLs. Will any of the England players rebel? Maybe not - people generally don't when you hold a gun to their head. But let there be no doubt that this is exactly what the ECB are doing. No surprise that Giles Clarke has taken this view - he's very much one of the "old boys" - I'm sure the thought of women playing cricket at all - let alone getting paid for it - disgusts him. The ECB are only slightly more forward-thinking than the catholic church, which is exactly why they continue to choose captains that are all in the same mould - the likes of Gower, Atherton, Hussain, Vaughan, Strauss, and now Cook. Anyone who is not in that mould invariably does not last very long as captain (Butcher, Tres, Freddie, KP). If KP were England captain, I doubt he would have complained about the Mankad - he'd have said Buttler got what he deserved - that's assuming he didn't tell Buttler after the first warning to watch what he was doing. Nothing positive will happen in English cricket while stuffy old blazer-cladden buffoons like Giles Clarke are in charge. Perhaps the looming WICL had some influence over the decision to make a few of the players (18 I think) professional (in the sense of some guaranteed income - some quite small sums). In doing so they have a degree of control over them that would not apply if they were amateurs. It would be interesting to know WHY the ECB are against it. Two or three weeks in September doesn't really seem to threaten anything. Doubtless they won't tell us. The 'other' bloke in the picture looks remarkable like the bloke that went to prison - was it Stanford - for financial crimes. Ironic choice of photo if I'm right !